The Stinger Strut makes fine tuning the performance of any mono a snap. Its quickly adjusted from positive to negative thrust angles. And has cross drilled bearing to hold grease for extra smooth driveline. 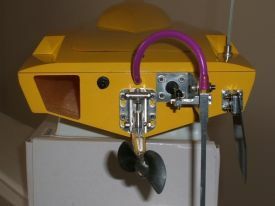 The Speedmaster Mini rudder and bracket come with a built in water pickup in the rudder. 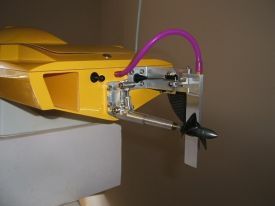 The rudder measures 4" long and 3/4" wide. For 2s - 4s Lipo electric or up to .21 nitro applications. NOTE: Turn fin not included, boat not included.